Who doesn’t like luxury? The pampering, the rejuvenating experiences, the reviving sun, the refreshing sea, the new aromas, the sumptuous tastes, that special attention to detail, the promise of something new? And though we may be living in harder times in terms of the coveted security we all seek in life, which usually comes in the form of a steady job and a constant flow of cash, at this very same time the popularity and demand of luxury travel is increasing by the day. In fact, the luxury travel market is the fastest-growing part of the travel industry worldwide. Why? Well, tourism experts all point to one thing when trying to define what luxury really is. In one word: exclusivity. In an era of instant gratification and conspicuous consumption, people want that special something that will promise to make their stay matter, that will provide memories, will change their days once they are back home, will make their lives a little better. This, in the words of hoteliers and travel specialists, all comes down to authenticity of experience. Greece has been welcoming tourists for decades. Boasting pristine beaches, magical islands, a plethora of traditions, and of course, over 350 days a year of ebullient sunlight, Greece has indeed been blessed with the natural wonders that keep tourists coming. But as more countries tap into their tourism potential and as holidaymakers become more demanding and knowledgable, Greek entrepreneurs have in the last decade or so begun to work towards higher standards, adapting to the changing desires and needs of those very visitors who chose these shores for their first steps in the Mediterranean sun years ago or the starving-for-adventure traveler ready to make it happen. Whether it’s the massive all-inclusive upscale resorts of the larger Greek islands like Rhodes and Crete, offering everything under the Greek sun from heavenly cuisines to awe-inspiring decors or the small boutique hotels that are popping up across the land providing breathtaking scenery and insight into local traditions, Greek luxury travel is gaining ground in the international travel market with rave reviews almost every week in prestigious travel media and securing a soft spot in holidaymakers’ hearts. The GTP takes a closer look at luxury travel in Greece. The first in our series focuses on city break hotels. From the lavish hotels in Athens and its surrounding suburbs to the coastline of Attica and the islands, luxury accommodation has come a long way, combining the highest quality services, in the finest designed surroundings, with the best levels of personal service, offering gastronomic delights of the highest calibre while focusing on the one thing that can make or break a holiday: hospitality and the human touch. Boasting 543 of the city’s most elegant rooms, award-winning cuisine, top-notch conference facilities and upscale leisure offerings, Athenaeum InterContinental guarantees that even the shortest stay becomes a memorable experience. Superb service, attentive staff and fine food just add to this five-star hotel’s fully-equipped rooms, amazing pool and wonderful views. Near Athens’ main sites, the Athens Ledra Hotel also provides the best in conference facilities and special events planning. This award-winning hotel, located in Ilissia, named after the historic river mentioned by Plato still flowing underneath, exudes elegance and luxury. Only a 20-minute walk from the happening heart of the Greek capital, Syntagma Square, this city hotel provides guests with the friendliest service, sophisticated facilities and gourmet experiences that promise to make the Athens experience unique. If pampering is what you need then look no further. The Electra Palace Athens, one of the Electra Hotels & Resorts, offers the finest: everything from wellness & fitness at its state-of-the-art gym/center to roof garden dinners and drinks by the pool. Located in the heart of Athens, in one of the most romantic neighborhoods, the Plaka, with a breathtaking view to the Acropolis, the Electra Palace Athens combines the aesthetics of a stately past with the luxury of a demanding present, which means everything from marble-tiled bathrooms and jacuzzi bathtubs to custom furniture and the finest cuisine. 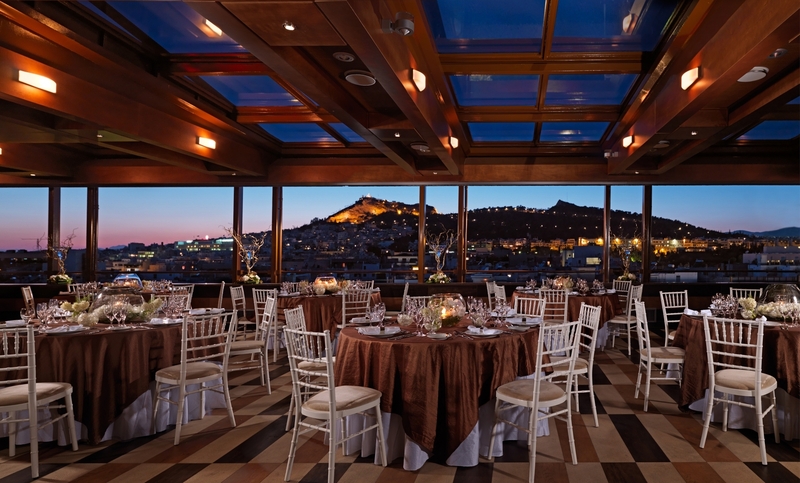 Built in 1963, the historic Athens Hilton is one of the city’s top luxury hotels, located in a prime location with a magnificent view of the Acropolis, on the one side, and of Lycabettus Hill, on the other. 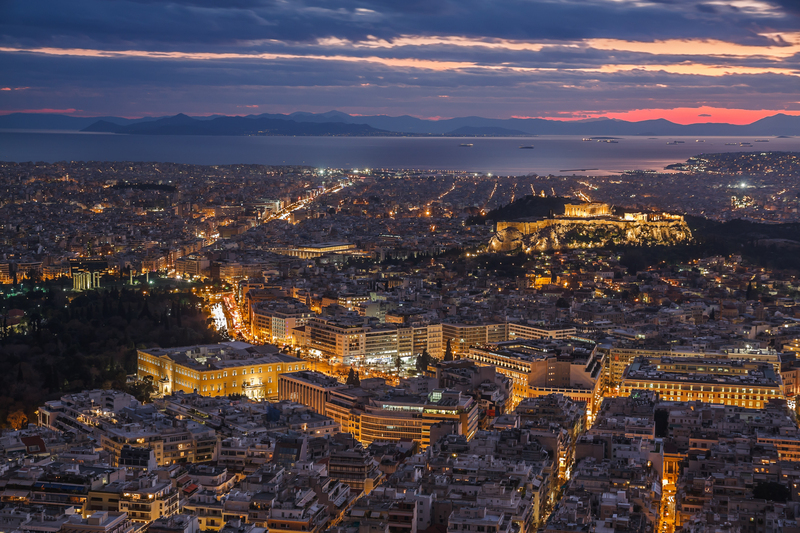 Whether it’s the award-winning restaurants, the vibrant bars, the spacious suites or its three fabulous swimming pools plus spa, the Hilton experience will have visitors coming back to Athens sooner than they thought. 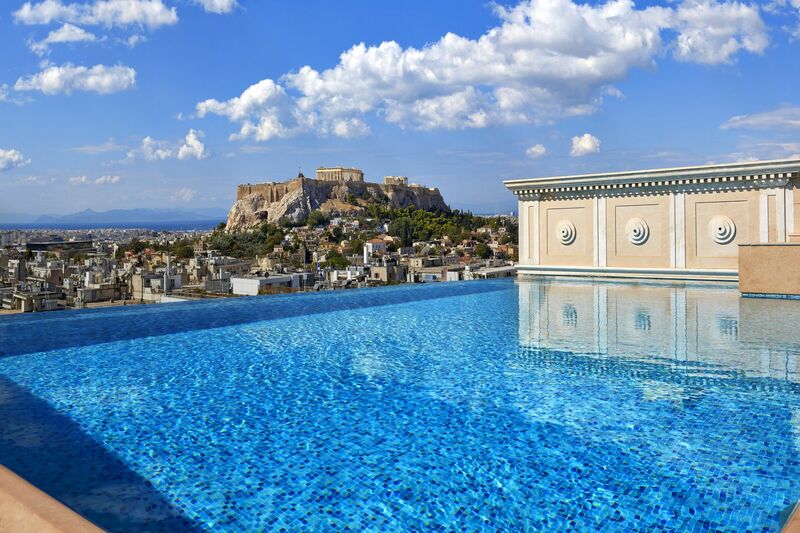 If luxury has a name in Athens, then Grande Bretagne is it. Founded in 1842, the Hotel Grande Bretagne is located in the heart of Athens, and within walking distance of the Greek capital’s shopping district, major museums, business area, the Monastiraki market, the Panathenian Stadium – where the first modern Olympics were held – and Athens’ archaeological sites. A member of the Starwood Hotel & Resorts, the Grande Bretagne is all about meticulous attention to detail, boasting 320 rooms and suites that exude old-world elegance while including the latest in comfort and facilities. As if that weren’t enough, exclusivity is the name of the game here with 56 of the hotel suites offering additional benefits, including a personalised butler service. 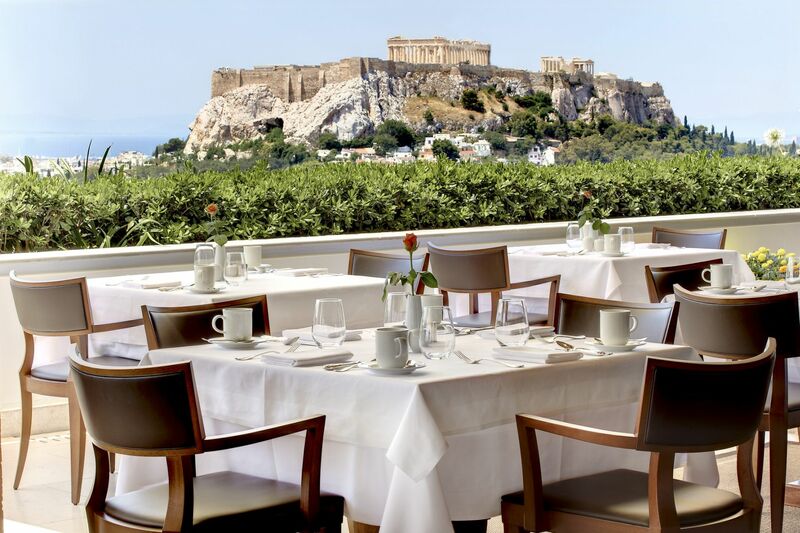 Most of the country’s famous visitors – kings, queens, rock stars and statesmen – have stayed here and enjoyed the most breathtaking views of the Acropolis from the hotel’s prize-winning roof garden indulging in the finest cuisine. Built in 1930, the King George, also a Starwood Hotel & Resorts member, is indeed a “king” among Athens hotels. Located in the center of the vibrant Greek capital, the King George is all about luxury and pampering. Boasting 102 guest rooms and stunning views of the cityscape, including the Parthenon and Lycabettus Hill, this historic hotel is minutes away from the Acropolis, the Ancient Agora, Plaka and Thission, not to mention a short walk from Athens’ exclusive boutique shops, museums and business district. 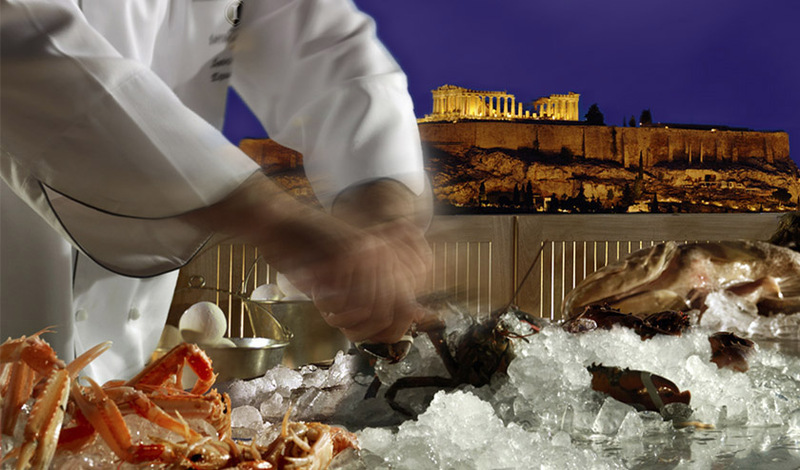 Greek cuisine with a twist as well as signature cocktails make the stay here memorable. Overlooking central Syntagma Square is this gem of a hotel offering affordable luxury, exceptional service and a welcoming home away from home. Upscale travelers can enjoy the magnificent view, high quality service, warm hospitality and a breakfast that’s got visitors bragging. Overlooking one of Athens’ green oases, the Pedion tou Areos Park, Radisson Blu Park Hotel Athens first opened its doors in 1976, offering a discreet upscale ambience, spacious rooms, the best in modern amenities and a caring staff that’s been lauded. What’s more, the lovely roof garden is a refreshing spot for a delicious candlelight dinner and a nightcap by the pool. In these times of technology savvy travelers, it is vital that hoteliers provide the best and only the best because these visitors know their stuff, are willing to pay for it and are expecting only the finest. The next step is to get the word out across the social media spectrum. That’s where the Greek hotel experience culminates and local businesses make their way into travel sites, blogs, international media and review pages. Hoteliers who do their homework are rewarded while social media and groundbreaking apps like Google’s Grow Greek Tourism Online are saying it loud and clear: Greece is the word, folks. Stay tuned for the next in the GTP’s series of Luxury Hotels. Your article about Greece being branded as a luxury travel destination is an eye-opener. While I enjoyed reading this article, I am not sure if pivoting towards luxury is the best way to sell Greece. At TigSee.com, as a newly launched vacation planning platform, we offer travelers to create a personalized, authentic and emotionally satisfying experience to Greece among other destination. We hand-pick regional destination experts to provide one of a kind experience where a traveler in addition to all things you mentioned, can mingle with the local community, discover culture through cuisines, and be transformed by the cultural, nature and artistic values of a destination.